Safecoat Flat Zero VOC is a premium quality, fast curing paint designed for interior surfaces where a flat finish and superior film formation properties are needed. Safecoat formulas are uniquely designed for optimal indoor air quality and minimal exposure to chemical toxicity. They are ideally suited for areas in which the health of occupants is of particular concern, including schools, hospitals, homes, and offices. Safecoat contains no formaldehyde, ammonia, aromatic hydrocarbon compounds, exempt solvents or hazardous air pollutants. 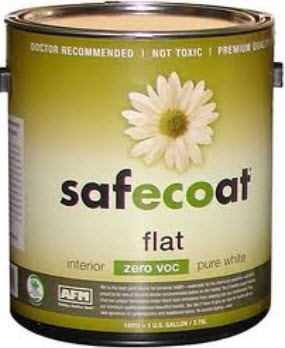 One gallon of Safecoat Zero VOC Flat covers approximately 350 square feet in one coat depending on surface porosity. Untreated drywall will require several coats.